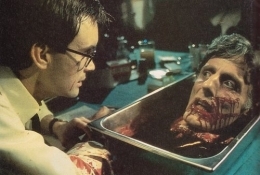 RE-ANIMATOR, one of the highest-grossing (and grossest!) horror films of the 1980's, has been acquired for theatrical distribution by L.A.-based Holland Releasing. The wildly popular black-comedy diappeared from the big screen shortly afetr its initial release in 1985, and we're excited to be presenting it to a new audience of horror fans. The film was produced by Brian Yuzna and directed by Stuart Gordon. Loosely based on an H.P. Lovecraft story, RE-ANIMATOR puts a spin on the classic Frankenstein story. Jeffrey Combs stars as the preternaturally intense Herbert West, a maverick medical student whose gory, gooey experiments cause bloody corpses and body parts to jerk to life. Co-star Bruce Abbot is the studious roommate drawn into his extracurricular experiments, which soon involve the dean's daughter (the frequently naked Barbara Crampton) and the college's cadaverous, calculating star professor (David Gale), who literally loses his head over a battle for West's discovery. Charged with sick gallows humor and a ghoulish gallery of undead beasties, RE-ANIMATOR is one of the most inspired and inventive -- and funniest -- horror films of the 1980s.